“We were introduced to Mr. Hans Heintzelman about 4 years ago at the beginning of a major renovation at our home. The project included installing about 1000 square feet of new hardwood flooring and removing carpet in a dining room, parlor and hallways. The carpet removal revealed a 1937 hardwood floor in which there were several defects because of HVAC ductwork, etc. These defects were patched and the old floors restored in a way that is now invisible, essentially perfect. The new flooring was for a large family room with a fireplace and stairs. The space provided a creative design opportunity that excited Hans. He lived up to the challenge and the room is beautiful. We receive innumerable compliments about its appearance. The overall design, including special detail around the fireplace and each corner, are brilliant. In addition to the fine professional work, he and his assistants were very conscientious about the noise and the enormous amount of dust secondary to the sanding. Each day they cleaned up the mess and were always friendly and courteous. His workmanship, creativity and attitude were outstanding. “I love your floors!” is the number one compliment I receive when people visit my house for the first time. When my husband and I bought our house in 2010, we fell in love with the space, the updated kitchen and sunroom with beautiful white oak floors, the basement, and the potential to grow into this house. The house was built in the mid-1990s and while some updates had been done, there were definitely remaining elements that were consistent with 1990s style such as the white tile in the entrance and hallway along with white carpet in the living room and dining room. As a family with young children, white carpet under a dining room table is a disaster waiting to happen. But we knew that the floors could be changed and planned to do so “down the road.” Well, that road was a bit shorter than we anticipated. In May of 2011 we awoke one morning to find our refrigerator icemaker hose had split in the middle of the night flooding out the kitchen and part of the basement. My beautiful white oak kitchen floors soaked up the water like a sponge. As I worked with a water mitigation specialist in town, we discussed my options. 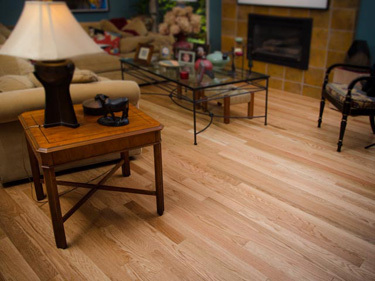 I was referred to Hans Heintzelman to discuss what could be done to salvage my current hardwoods and a local flooring store to discuss other flooring options. I contacted Hans and the flooring store, searched for information on the web, and consulted the greatest source of information … other moms with young children. 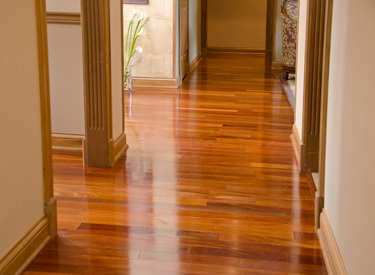 I found that custom hardwood floors last longer, can be repaired/refinished easier, age better, and enable one to be more creative with their floor design. Hans was able to come up with a plan to restore my beautiful kitchen and extend the white oak floors throughout the rest of the main floor. 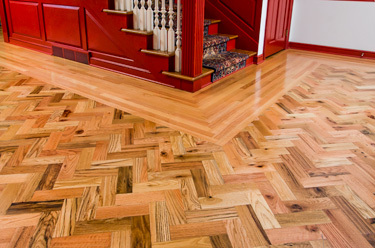 He was able to match the flooring with my pre-existing white oak floors so I didn’t have to rip out the undamaged floors in the sunroom, and he designed the most beautiful herringbone pattern for the dining room out of white oak and teak. The effect is amazing and eliminates the need to have a decorative carpet under the dining room table. I can enjoy my dining room with my children. Hans was upfront and honest about the time it would take, the preparation work required, and the amount of dust to expect. His taping/wrapping/sanding process kept the dust to a minimum. He was done on time, on budget, and everything was touched up and restored beautifully. Hans takes pride in his work and that shows not only in his workmanship but in his service after the work. I have contacted Hans post-job with questions and other flooring needs. He is always quick to respond and provides excellent advice and guidance. "Hans Heintzelman was an enormous help to us when we moved into our new home several years ago. It was mid-December and we were on a strict timeline to have a new floor installed. Hans not only suggested a location for us to look and purchase our hardwood, but he finished the job in a matter of days, keeping us on schedule. In addition to the wonderful workmanship, Hans and his crew provided, they were personable, attentive and put our needs first. We have had numbers positive comments about how beautiful the floors are. We have and will continue to highly recommend Hans to anyone interested in improving the look of their home." “Talk about professional... Hans has it covered in every way you can imagine! We had parquet floors before we had our downstairs bathroom flood while we were sleeping (isn't is funny, these things always happen while you're sleeping). Two people recommended Hans, a colleague and the insurance adjuster. They were right on! We couldn't find parquet that would match our floors so we did the whole thing over. And we are so glad! 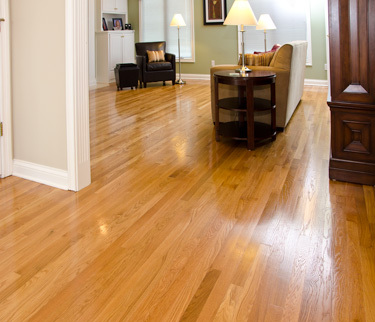 We got a beautiful light oak floor that complements our decor and looks fantastic. Thank you Hans... you're the man!" Thank you so much for an extremely professional job. 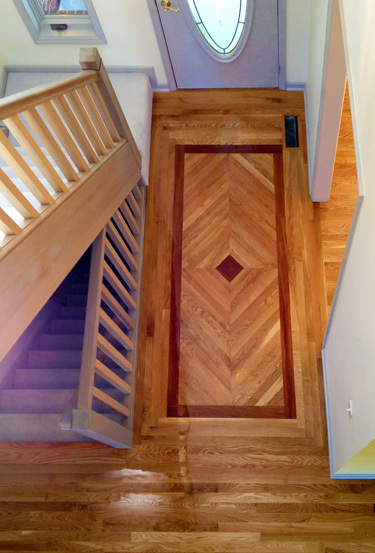 Your oak floor installation looks terrific, especially the intricate design in the front foyer. We were recently away in Michigan and returned to see the floors afresh, and they are indeed beautiful. Thanks again for your craftsmanship and cordial manner.